Summary of today’s show: Scot Landry and Fr. 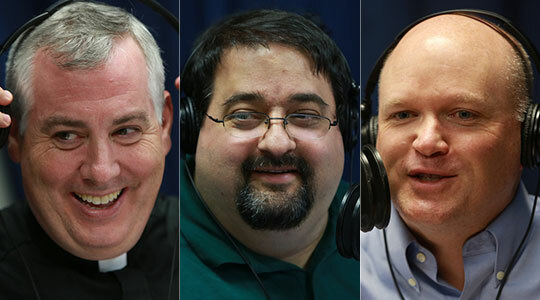 Mark O’Connell are joined by Domenico Bettinelli to discuss the Parable of the Life-saving Station and to consider whether our Church—our dioceses, our parishes, and our parishioners—have lost the sense of their true mission to evangelize the world and to render true worship to God as a community of faith. What is essential about the Church? Have we lost sight of the way? These considers and more are considered as well as this coming Sunday’s readings from Mass. Fr. Mark O’Connell also noted that he’s been the master of ceremonies for Bishop Walter Edyvean’s confirmations for many years, but this past weekend he participated from the pews as the sponsor of his niece. Scot asked if he’s her favorite uncle. Fr. 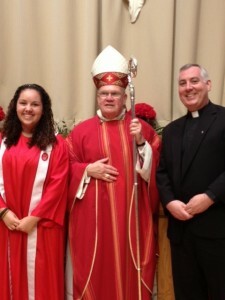 Mark said it’s the first time he’s ever been a confirmation sponsor. Fr. Mark said he didn’t see any flaws or need for improvement in Bishop Edyvean’s confirmation Masses observing from the pew this time as opposed to be at the altar. Scot and Fr. Mark also discussed the Red Mass, Cardinal Seán’s homily, and the talk by Rep. Chris Smith from New Jersey at the luncheon after. Fr. Mark said it was an amazing pro-life talk from Smith. Scot said today we’ll be talking about the Parable of the Life-saving Station. 2nd segment: Scot said he was pointed to this parable by a fundraising consultant, who said he used it with Christian churches to ask what they’re really about and what they want to be. Some of the members of the life-saving station were unhappy that the building was so crude and poorly equipped. They felt that a more comfortable place should be provided as the first refuge of those saved from the sea. They replaced the emergency cots with beds and put better furniture in the enlarged building. Now the life-saving station became a popular gathering place for its members, and they decorated it beautifully because they used it as a sort of club. Fewer members were now interested in going to sea on life-saving missions, so they hired lifeboat crews to do this work. The life-saving motif still prevailed in the club’s decorations, and there was a liturgical life-boat in the room where the club’s initiations were held. About this time a large ship wrecked off the coast, and the hired crews brought in boat loads of cold, wet and half-drowned people. They were dirty and sick. The beautiful new club was in chaos. So the property committee immediately had a shower house build outside the club where victims of shipwrecks could be cleaned up before coming inside. At the next meeting, there was a split among the club membership. Most of the members wanted to stop the club’s life-saving activities as being unpleasant and a hindrance to the normal social life of the club. Some members insisted upon life-saving as their primary purpose and pointed out that they were still called a life-saving station. But they were finally voted down and told that if they wanted to save lives of all the various kinds of people who were shipwrecked in those waters, they could begin their own life-saving station. So they did. Highlights from the discussion: It’s a part of human nature to want to turn inward to the ones we know and exclude those we don’t. How many of our parishes started as a few people gathering together in a mission? Do we outsource faith formation to others? Do we point to others as being responsible for faith formation and evangelization? The Church has been described today as a life-saving station, a club, a team, and a family, but it’s as a family that we have the truer identity. The primary mission of the Church is the salvation of souls and we do that in a variety of ways.